The black walnut is more difficult to crack than the English walnut; its meat is described as bold and earthy, while the English walnut is described as having a sweet and mild taste. That may be why English walnuts are often eaten as snacks, and black walnuts are added to sweet confections such as candy, ice cream and muffins. While the two nuts are closely related, there are some differences in their nutritional makeup. The difference in calorie content between the two types of walnuts is slight, with 173 calories in an ounce of black walnuts and 183 calories in the same serving of English walnuts. A 1-ounce serving is equal to about 14 walnut halves. Both types of nuts are a healthy but concentrated source of calories: You may eat more than you intend if you don't portion beforehand. Both nuts contain the same amount of fiber, 2 grams per ounce, but the carb and protein content varies. 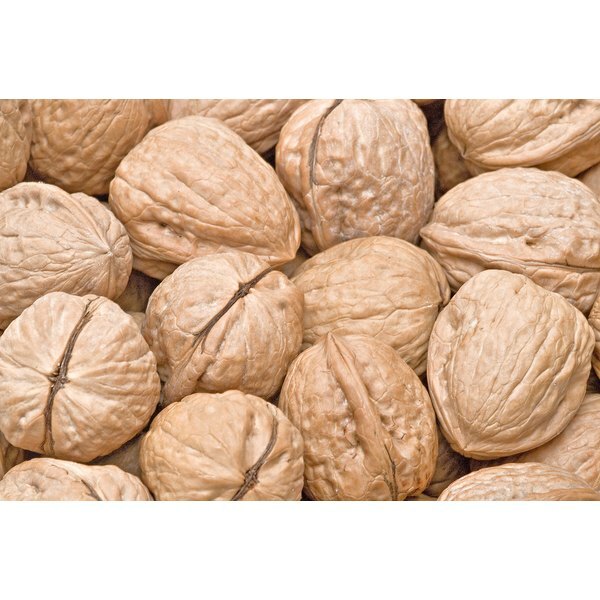 If you're counting carbs and trying to get more protein in your diet, the black walnuts, with 3 grams of carbs and 7 grams of protein, may make the better choice when compared to the 4 grams of carbs and 4 grams of protein in the English walnut in the same 1-ounce serving. What sets walnuts apart from other nuts is their omega-3 fatty acid content. Omega-3s are essential fats that promote heart health. If you're trying to get more omega-3s in your diet, English walnuts are the clear winner. A 1-ounce serving of the English nut contains 2.5 grams of omega-3s, while the same serving of the black nut contains 1.5 grams. Omega-3s in plant foods are in the form of alpha-linolenic acid, which the body partially converts to eicosapentaenoic acid and docosahexaenoic acid. It's not well-known whether the omega-3s in ALA form have the same benefits as EPA and DHA, which are the omega-3s naturally present in fish. For good health, the University of Maryland Medical Center suggests 1 gram to 2 grams of ALA a day, so either nut more than adequately meets your daily needs. Neither nut is a significant source of any vitamin, but there are noted differences in the vitamin E and B content. The black walnut meets 3 percent of the daily value for vitamin E in an ounce, while the English walnut only meets 1 percent. As an antioxidant, vitamin E protects lipids from oxidation. The B vitamins are a collection of vitamins best known for helping make energy out of food you eat. Both walnuts meet 8 percent of the daily value for vitamin B-6, and the English walnut is a better source of thiamine, meeting 6 percent of the daily value, and folate, meeting 7 percent of the daily value. All the other B vitamins, including niacin, riboflavin and pantothenic acid, meet 5 percent or less of the daily value in either nut. Both black and English walnuts are good sources of the trace minerals copper and manganese, meeting about 20 percent of the daily value for copper and about 50 percent of the daily value for manganese in the same serving. Manganese is needed for bone formation and also processing cholesterol, carbs and protein. Copper also helps keep your bones healthy and assists iron in making red blood cells. Both nuts are also a good source of magnesium, with 14 percent of the daily value in an ounce of black walnuts and 11 percent in the same serving of English walnuts. Not only does magnesium participate in more than 300 biochemical reactions, but it also keeps your heart beating and assists in keeping your bones strong. Serious Eats: What's the Difference Between English Walnuts and Black Walnuts?